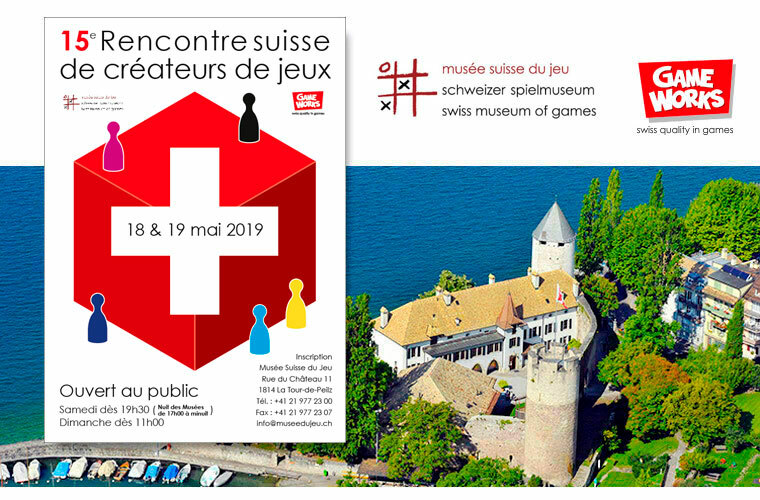 The fifteenth Swiss game designers' meeting will be held in the medieval castle of La Tour-de-Peilz on May 18th and 19th. Sometimes because of language barrier, other times because of isolation, Swiss game designers do not get to know each other very well, if at all. Furthermore, as the gaming world consists of small groups of gamers, many amateur designers do not have access to groups of play testers, cannot get their prototypes tested and do not know about game market standards. Others just are not aware of their game's potential, and many prototypes end up at the bottom of a drawer, never again to see the light of day. Thats why we propose this meeting year after year. Its goal is to meet, to exchange information, and to make contacts, in order to stimulate everybody's creativity. This event is open to any designer, Swiss or not, professional or amateur, published or not. But, don't forget, the motto is PLAYING! You will have an opportunity to have your prototypes criticised by a peer-group of designers and tested by publishers and experienced players, as well as spending the weekend in the fabulous setting of the Castle at La Tour-de-Peilz, situated at the shore of Lake Geneva, and overlooking the mountains of the French Haute-Savoie. On Saturday evening (at the occasion of the Night of the Museums event), the convention will be open to the public between 7.30 p.m. and midnight, which provides the opportunity to have your game tested by the public. The same goes for Sunday, starting at 11a.m. The Swiss Museum of Games welcomes you and is looking forward to hosting this 15th designers' meeting. - Sunday Breakfast at the Museum. 15h00: Conference (in French). This year will be a double feature: First, Laurent Escoffier (CapColor, Loony Quest, PIX, Bloom...) will tell us about his experience as a guest teacher for game design in a Montreuil school as well as in a school for video games in Paris. Next, Isaac Pante, Teacher and research leader in digital culture and publishing (UNIL) as well as founding member of the UNIL Gamelab will present us gaming as seen through the lense of university academia. 18h00: closing, followed by a meal in a pizzeria nearby. 19h30: Back at the museum for a gaming night in parallel with the Night at the Museums event. There are many hotels between Vevey and La Tour-de-Peilz. The closest hotel to the museum here. Or here if you have a car.